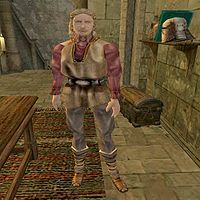 Urfing is a surly Nord trader located inside the Moonmoth Legion Fort. He wears common pants along with matching shoes and shirt and carries a steel mace. Aside from his natural resistance to shock, immunity to frost, ability to shield himself, and a natural frost damage spell, he knows Almsivi Intervention, Almalexia's Grace, Divine Intervention, Soultrap, and Telekinesis. He offers a small selection of odds and ends and has little gold. This page was last modified on 23 November 2018, at 06:21.